The holdup in negotiating a contract extension falls completely on Ndamukong Suh’s shoulders. He fired his agents several weeks ago and hasn’t hired new representation. Lions GM Martin Mayhew spoke to Suh just before the NFL Combine. Mayhew told reporters that Suh had told him he was close to hiring an agent but had not decided on one. Mike Garagolo, FOX Sports 1 NFL Insider, reported via Twitter on Tuesday that Suh is considering representing himself in the negotiations. It wouldn’t be a first for an NFL player to represent himself, but it’s not commonplace. Suh is looking at a complicated extension. Mayhew is a lawyer experienced in drawing up contracts, Suh is not. In the long run, even if Suh pays an agent 3 percent, he might make more money off the deal than if he tries to go it alone. Suh’s current contract will count $22.4 million against the salary cap. An extension is needed to clear cap space, to sign free agents. 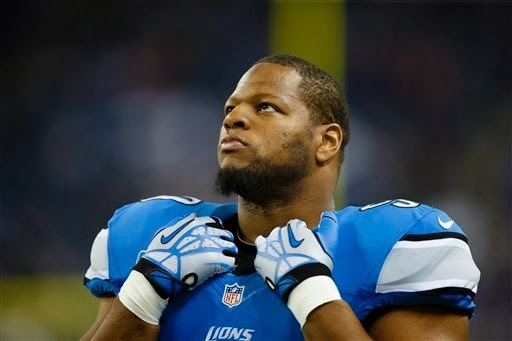 Suh is signed through 2014 and is set to make $11.5 million. In current deal, 2015 is a voidable year. NFL teams can start talking to free agents on Saturday. They can sign them beginning at 4 p.m. Tuesday, March 11. The Lions have three starters they would like to re-sign — tight end Brandon Pettigrew, defensive end Willie Young and cornerback Rashean Mathis.